I am looking to get long the SOYBEAN market. I will turn to the mini-contract which is 1/5 the contract size of the regular. 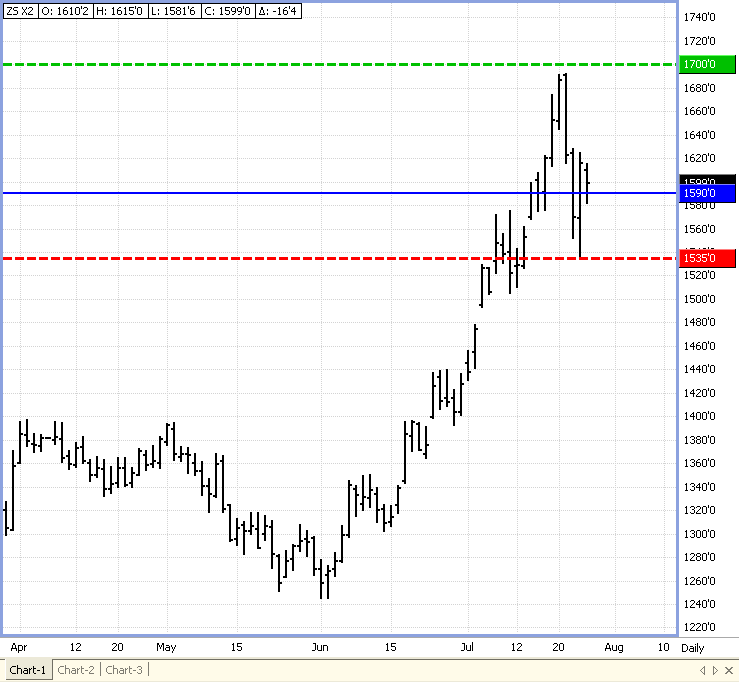 This will allow us to build a position should we choose to add additional contracts as the trade progresses. What is important to consider is what has changed We still haven’t received any rain worth getting excited about. Also, Monday’s Crop Progress report showed continued damage to the existing crop. This represents a 4% reduction in the good to excellent and a 5 % increase in poor to very poor. This is a very important time for soybeans as we enter the pod setting stage. With little to no moisture, things could get pretty bleak. We have seen reports of an easing of temperature and possible rain in the forecast, but I believe the small levels that are expected will not be enough. I like to be LONG soybeans but I don’t think it is necessary to put too much risk out there, so I choose the mini-contract. I look for this 1590’0 level to hold while risking 55 cents, and I think we will see a re-test of the 1660’0 level in the near future as we make another run to 1700’0.